Merry Christmas or whatever winter holiday you may or may not celebrate this time of year. We have a lot to cover, so buckle up, buckaroos. First – The Metroid Database Bestiary is back. The MDb Bestiary is one of those massive features our site has that took a bit longer than expected and wasn’t available at launch. After some some re-implementation and more tweaks here and there, we now have Bestiary 2.0 available for your perusal. While the overall look and functionality is basically the same, I hope you guys enjoy it just as much as you did before. You can also access it by clicking on the icon in the far upper right corner of the site. The #Memetroid Contest was the brilliant idea of our Twitter Editor, Sagi. He wanted to create a contest where we could fully unleash everyone’s dank meme skills. Now it’s time to put those skills to the test. Please go to our contest page to see what the #Memetroid Contest is all about and try to win our awesome prizes! 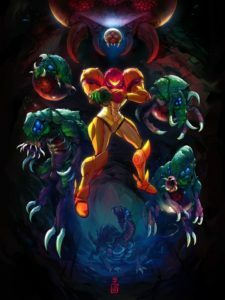 Our store is now offering prints of “The Hunted”, a 12×16 poster print made on thick matte stock paper, that is surely to complement any Metroid fan’s wall. The prints are limited edition, as I only had 50 made, and are individually numbered. The artwork was drawn via commission by Manos Lagouvardos (aka Smolb), one of our talented Bestiary artists, who also happens to be a professional comic artist in Greece. We thank Manos for his talent and his contributions. We hope you can appreciate this print as much as we do. I will actually be rather sad to let them all go. They are really beautiful prints. Also pertaining to our store: From Christmas until New Year’s, we are offering our Decals at a low low price of $1 each. This price is good through the last minute of December 31. Thank you all and for any purchases made through our store. Your contributions directly help and allow us to offer you more goodies! We are so happy to be stewards to the Metroid community at large and don’t take any of it for granted. You have stuck with us for 21 years and we’re so grateful to be a part of it all! On behalf of the rest of the staff of Metroid Database, we wish you and your loved ones a very happy holiday season.